When some of my friends were visiting last week, we opened up quite a few jars of my pickled treasures lining my canning pantry shelves. We all enjoyed the puckering pickled tastes and everyone wanted to know how I did it. Honestly... I don't remember. Yeah, I'm like that. That is why I have this blog. To help me remember things I used to know that are lost in the recesses of my crazy mind. To remind me of things that I once knew, and still know albeit buried under who-knows-what in my brain. Anyways, I know kinda what I did, and this is what I will be doing again this year. Heat vinegar on stove til VERY hot. Now, to the vinegar, you can add a bit of sugar. It's all up to you! I do add my sugar in with the vinegar so it dissolves. Add some sugar to one batch. Don't add it to another. Label and try it out later, see which one you like the best. I am pretty sure I did add a bit of sugar. I'm thinking a couple tablespoons per jar. process in hot water bath for 5 minutes to seal. For picking garlic or peppers or green tomatoes or anything else, I go by the same practice as above. Sometimes altering how much pepper or dill or adding another spice you might like. It is a VERY simple process with a grand outcome. 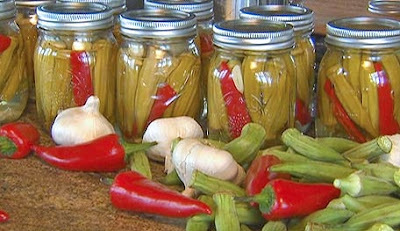 If you are a first time canner, this is a great way to begin! They look so pretty in those bottles. I have never had okra, but it looks good. It is not something that is grown around our parts here in Canada. What does it taste like? Your chicken coop looks nice and tidy. I love the smell when we clean ours and line it with cedar shavings. To bad the smell does not last long.